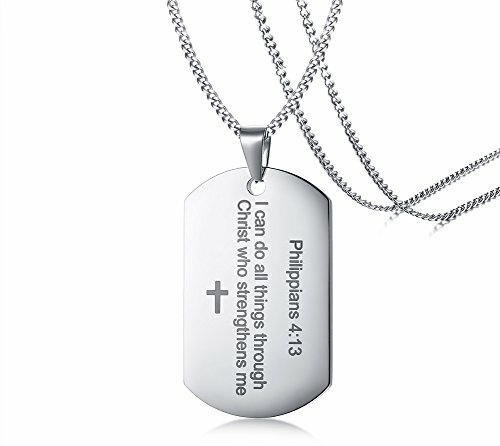 It Features the Bible Verse,Philippians 4:13, "I can do all things through Christ who strengthens me" engraved on the dogtag.This would be a great encouragement gift or gift for someone going through a difficult time. OUR PRODUCTS: 1. We choose stainless steel instead of brass or alloy. Because it's highly resisted to rust, corrosion and tarnishing. Durability and Fashionable. All makes it a top fashion accessory. 2. We choose vacuum ion plated instead of water plated. The color last longer than any other plated jewelry. This dog tag necklace is the perfect Baptism,First Communion,Confirmation,birthday gift for a special Christian in your life for everyday.